Being the mum to a girl and a boy I have noticed several differences when it comes to shopping for them. Firstly, there are generally racks and racks or girls clothing with cute little skirts and tights and accessories. In the boys section you find a small selection of jeans and jumpers. Secondly, I find the range of toys available for boys much better than girls. There is only so many times I can pretend to feed baby dolls and take Barbie for a ride in her car. Whereas Tigger’s toys always seem so much more fun. 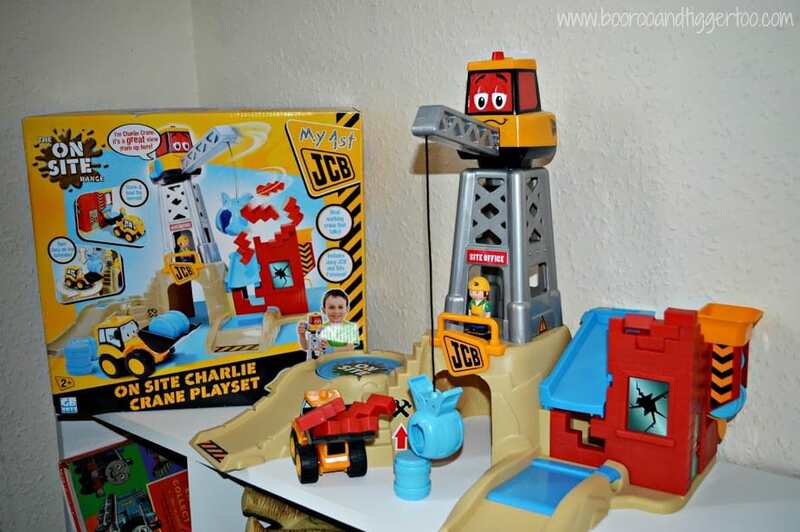 Take for example the JCB On Site Charlie Crane Playset we were recently sent to review from Argos. The playset simply slots together and the fun can begin in less that 5 minutes. 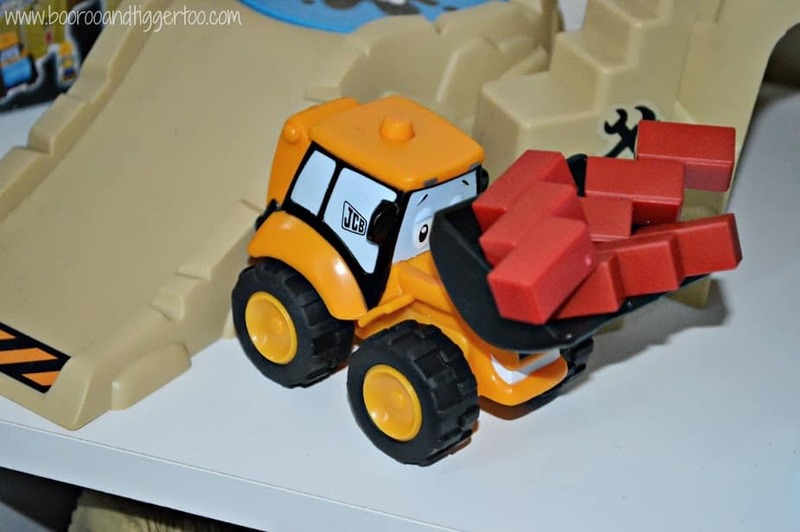 Included in the playset is a JCB truck, play figure, removable brick wall pieces and three barrels. With a working crane that can be used to pick up barrels or crash against the brick wall (no banging or crashing on girls toys). The barrel store on the side holds the three barrels when they are not needed. Or in Tigger’s case he likes to slide the little man through it whilst saying ‘I want it noowww!’ (from Charlie and the Chocolate Factory). Joey JCB comes complete with its bucket on the front, perfect for picking up the brick wall pieces that have been knocked down by the crane, moving barrels or in Tigger’s case holding his raisins. All in all a great little playset that will keep little boys (and mummy’s) occupied for hours. The slide is great for rolling Maltesers down too! Finally, shoes… Girls love shoes and a good job too as there are so many of them to chose from, ballet pumps, flip flops, boots etc. Boys on the other hand have a selection of trainers and boots. For example Tigger owns three pairs of shoes… wellies, shoes and his slipper crocs (which he insists on wearing everywhere). Roo, however owns more shoes than I do… trainers, shoes, slipper crocs, converse, pumps, wellies, boots the list goes on. Why is shopping for boys and girls so difficult? I’m so thankful that I can at least shop from Argos in the comfort of my own home. Plus they have started selling a wider range of clothes now I may never need to trawl the shops again. 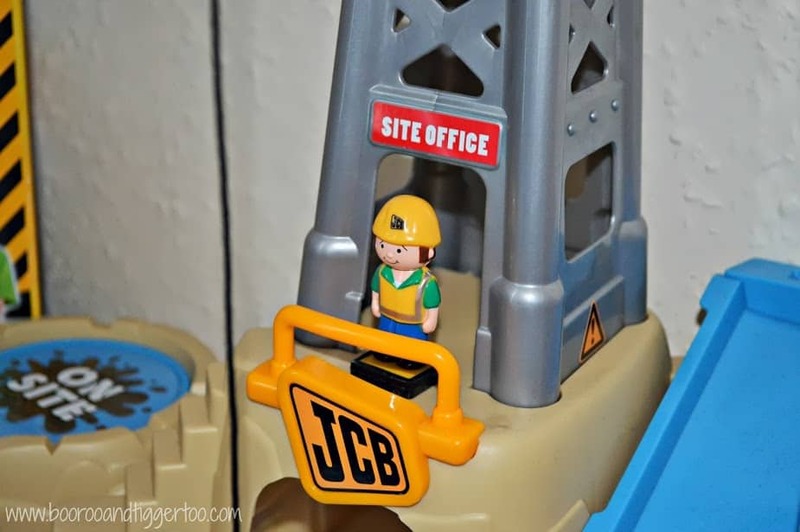 Disclosure Policy: We received the JCB On Site Charlie Crane Playset along with a DS game and Take n Play train in order to highlight the boys toy range available in Argos.